The beauty! The walking sitck is one that Bob is working on. 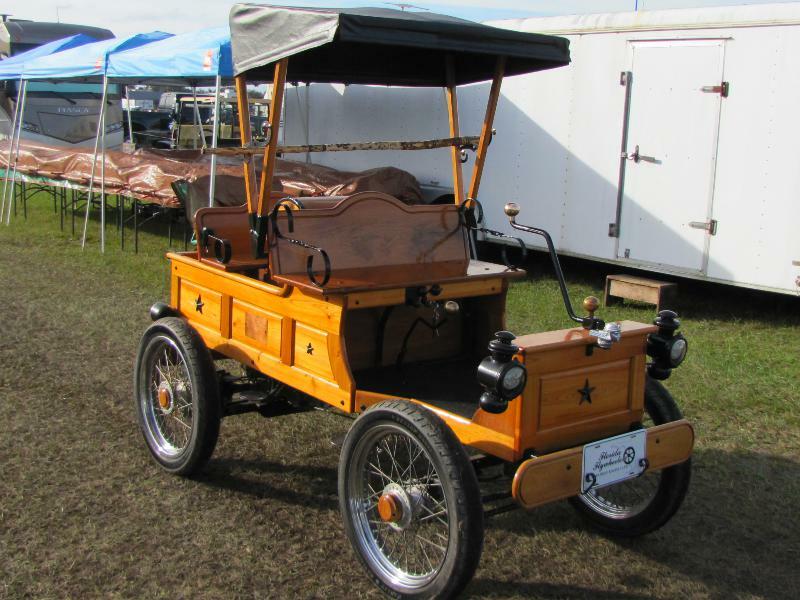 I was sitting in our vendor booth at the Florida Flywheelers show in January when I saw what looked like a downsized Model T Ford coming down the aisle. I snapped a picture and asked the couple about their vehicle. 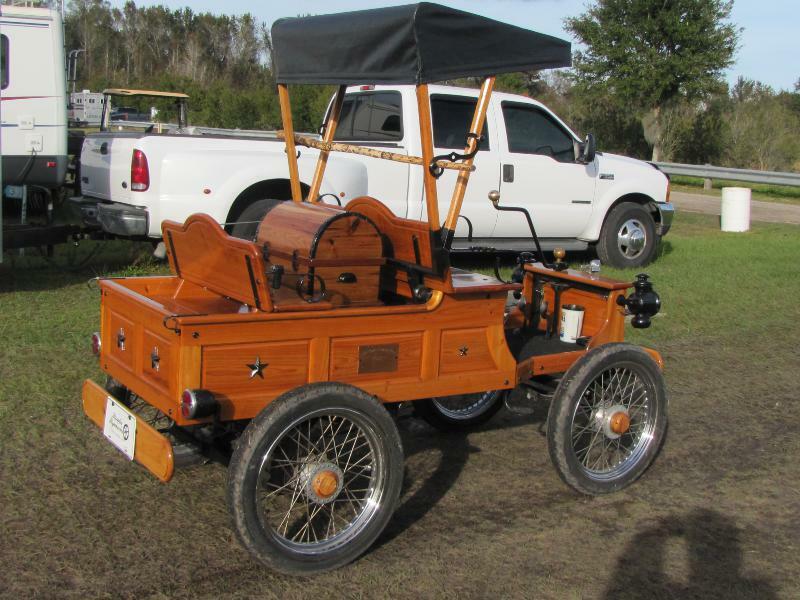 It turns out that this unique “automobile” was the creation of Bob and Carole Ramoski of Lakeland, Florida. Bob told me that he in fact made the vehicle from scratch. Carole is responsible for the finish on the wood, including maintaaining the beautiful finish by means of constant touch ups with sanding and re-varnishing the surfaces. Bob made cardboard templates for each of the wood body parts. Cypress wood was used for everything except the bumpers. Bob explained that cypress is a very soft wood not suitable for bumpers of a vehicle. As you look at this beauty you keep seeing the marvelous details that they added to this machine. 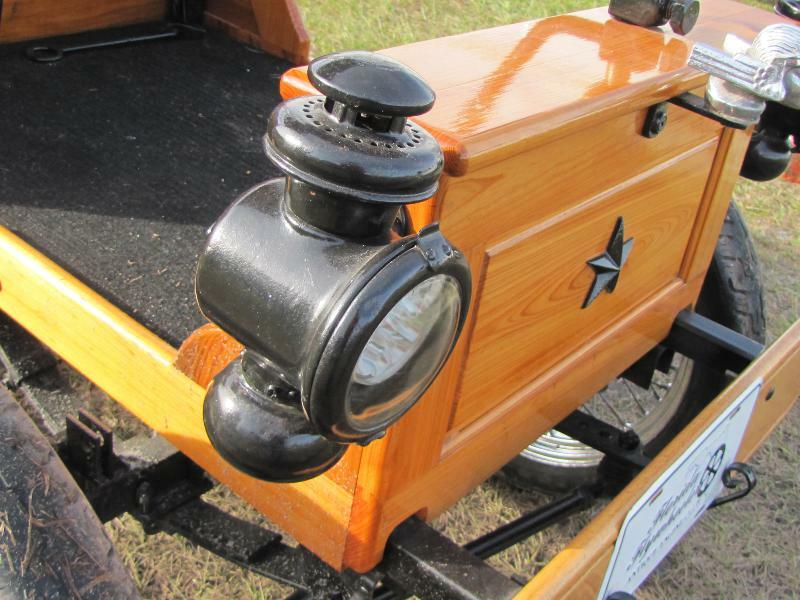 The headlights are original 1914 headlamps that Bob wired for electric lights, as the original were oil lamps. There is a Mercury hood ornament, and old buggy steps for the entering and exiting of the vehicle. Tailights were origianlly wood, but one of Bob’s neighbors cast them in iron for him, along with the hinges for the top. 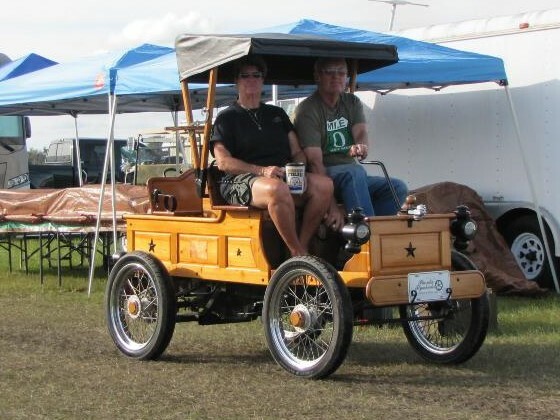 Model T Ford foot pedals are used on the finished cypress floorboard protected with a carpet. Bob made an attractive trunk behind the seat for storage. Motorcycle wheels are on the ground, complete with wooden hubcaps. Plant hangers make perfect armrests. A brass door knob finishes out the steering tiller. 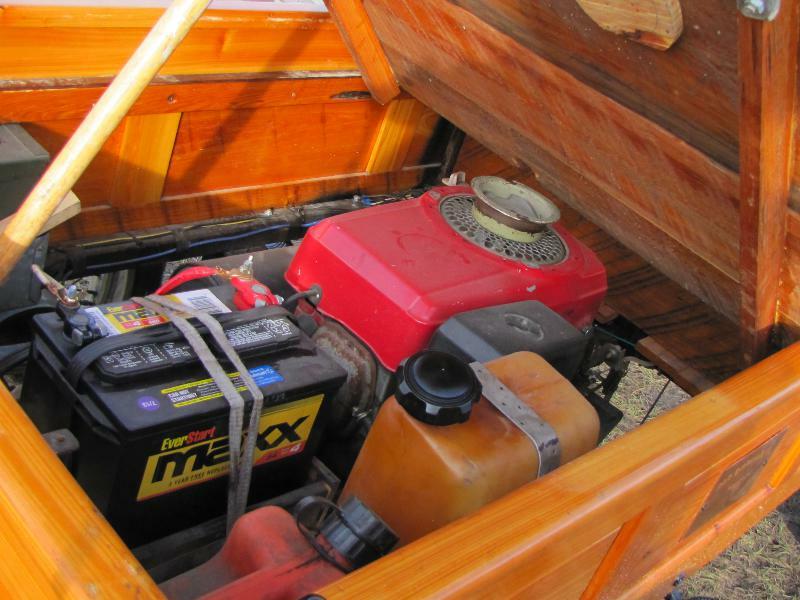 The powerplant for the vehicle is a Honda engine that drives the golf cart transmission. Bob and Carole, originally from Pennsylvania, now call Lakeland, Florida home. They have been coming to the Florida Flyhweelers shows for several years. They always drive their beauty of a vehicle in the parade each show. Carole shared that these times at the Flywheelers are a great time for them to relax and just enjoy these fun events. I enjoyed my conversation with Bob and Carole. We discussed Sher and my adventures on the road and they were gracious and generous with their time telling me the history of their neat home-made creation. Part of the enjoyment of travel is meeting interesting folks like the Ramoski’s. Thanks Bob and Carole. I enjoyed our conversation as well as the whole show!